Is it better to rely on hunting with a rifle or bow or to use traps instead? And should I focus on small game or big game? With regards to food procurement tools, why not use both? This allows you to utilize both a passive and active approach to procuring wild game. Out of the two, the passive act of trapping is far more efficient as the trapline does the work for you while you are back home or out hunting. My preferred setup is to have at least three dozen snares or Conibears set out. Once those are in place, I can use the rest of my time walking the land with my .22 rifle for any moments of opportunity for taking wild game. In recent years, I have switched over to a Hatsan 125 air rifle which is a .25 caliber and has excellent stopping power for shots on small game at 40+ yards. For big game, I prefer a scoped Savage .308. 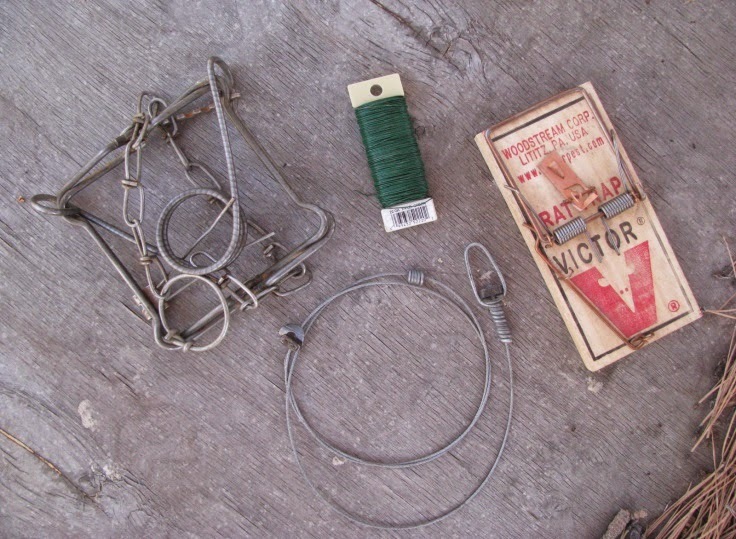 A #110 Conibear, spool of snare wire, rat trap, and commercial snare for small game. There’s a reason that most native cultures throughout the world focused on small game procurement on a daily basis in addition to large game as the former is far more plentiful. A deer will last a family of four for seven days and is a great addition to the daily menu but squirrels, rabbits, raccoons, beavers, and other rodents are far easier to procure on a consistent basis until you can take down a deer or elk. Squirrels, in particular, have a very high amount of interstitial fat, making them an excellent meat source preferable to lean rabbit meat. So, concentrate your efforts on the smaller critters along with attempting to procure a deer or elk.